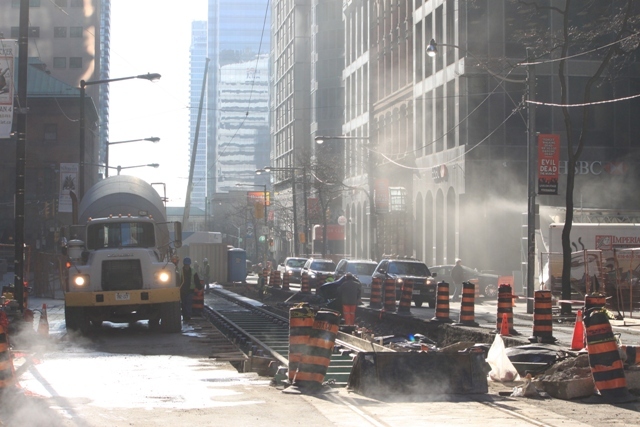 Updated December 3, 2013 at 12:20 pm: The last piece of track to be installed on York, from King south to Wellington, is now in place. Photos follow the break and the summary of events. 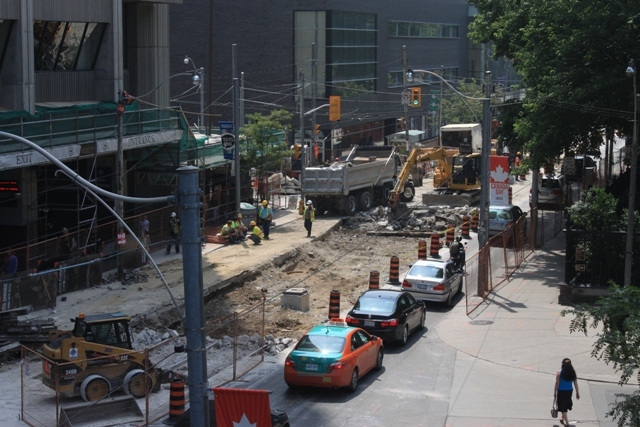 Updated September 14, 2013 at 4:30 pm: The intersection of Adelaide & York is under construction this weekend. Updated August 26, 2013 at 9:20 am: The work originally planned starting on August 24 at Adelaide & York has been deferred until September. Updated August 3, 2013 at 11:15 pm: New special work has been placed at Richmond and York, and the trackbed is excavated to just north of Adelaide. Replacement of the Adelaide intersection (with only a northbound tangent track) and vicinity is scheduled for the last week of August. Updated July 30, 2013 at 3:30 pm: Reconstruction of Richmond & York is now in progress, and some demolition of the old trackbed south from Richmond is underway. Between Richmond and Wellington, Toronto Water is working at several locations. 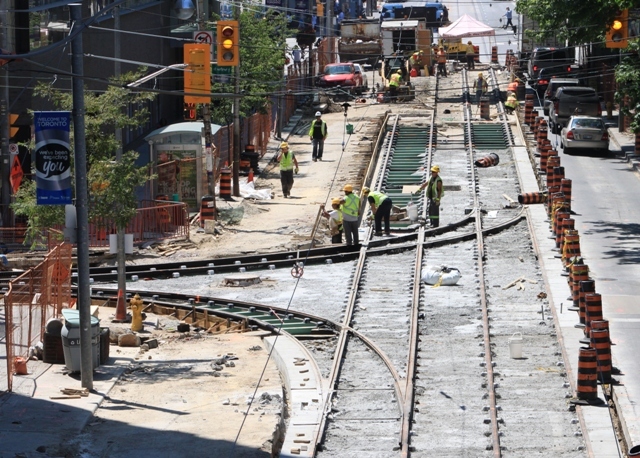 Updated July 25, 2013 at 5:10 pm: Streetcar service will resume operation on Queen between Church and Spadina on Sunday, July 28 at 5:00 am. 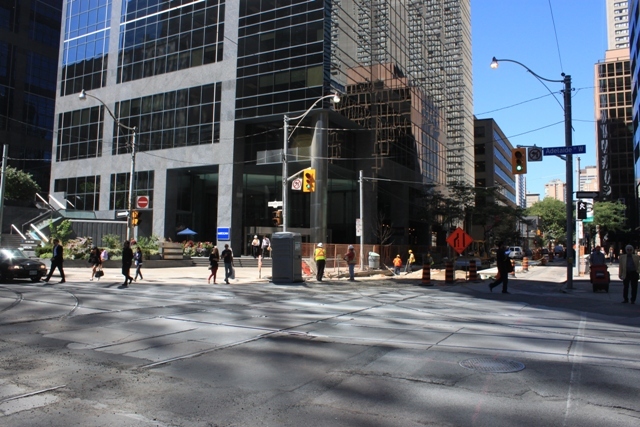 The York & Queen intersection will reopen to traffic both ways late on Saturday afternoon. The intersection at Richmond will close on Friday evening, July 26 at 8 pm for about three weeks and most of the special work will be removed. Only the northbound track and the west-to-north curve will remain. Updated July 17, 2013 at 11:10 pm: The diversion has been extended to July 25. Photos of the new trackwork have been added to this article. 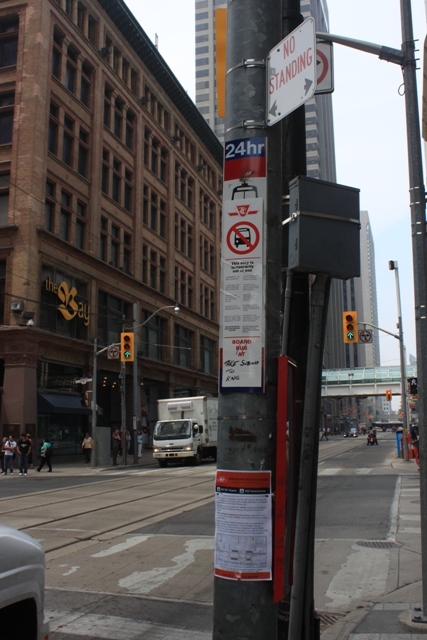 Updated July 7, 2013 at 11:30 pm: The diversion has been extended an extra week to July 22 due to construction problems at Queen & York. Updated July 3, 2013 at 2:30 pm: The matter of adequate signage explaining the diversion has been raised in the comment thread. Photos and comments on this topic follow below. Looking south from King. No, it’s not a foggy day, but steam from a nearby manhole. The new track for the section south of King sits north of the intersection awaiting installation. The completed track across the intersection. Excavation extends some distance east and west due to the removal of the old special work. Looking northwest across Adelaide & Spadina on September 5. Some of the intersection has already been removed during watermain upgrades. 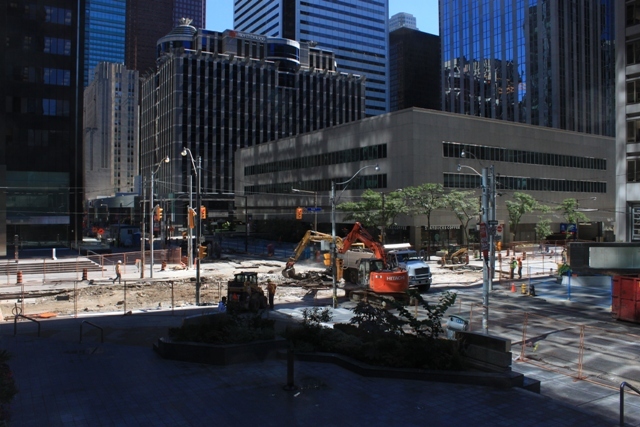 By midday on September 14, removal of the intersection was well underway. This was once 3/4 of a grand union showing how important the location used to be as part of the downtown streetcar network and the varied looping patterns for routes before the subway opened. It will now have a single northbound track. The view below is taken from the northwest corner. Looking north on York across Richmond showing the new west-to-north curve and trailing switch. The foundation concrete is in place for the northbound rails but they have not been placed yet. Looking south on York toward Adelaide. Reconstruction of York & Richmond is in progress. Only the west-to-north curve and the northbound through track will survive from what was a full Y junction when these were both two-way streets. Looking southeast across the intersection. Looking northeast across the intersection. 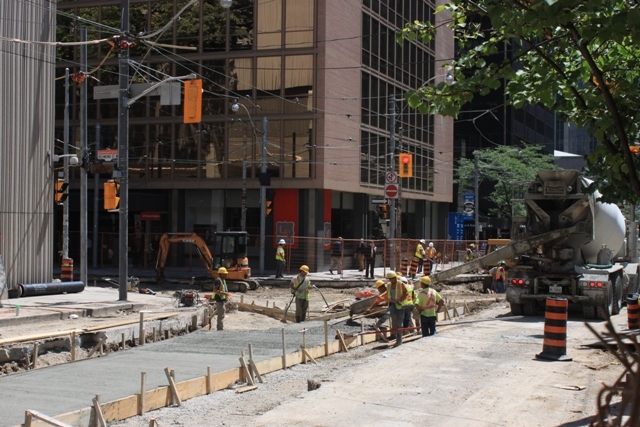 The new track has been in place on Queen and at the York Street intersection for about a week, and concrete placement is substantially completed. 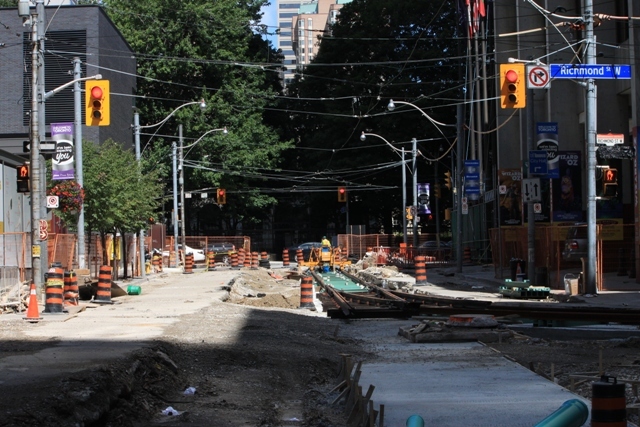 Looking north on York to Queen (photos taken July 15, 2013). Looking across the north-to-west curve onto Queen from York. Looking west on Queen from the Sheraton Centre pedestrian bridge. Meanwhile on King Street, an amusing diversion notice for the 503 Kingston Road car has appeared. According to this, the 503 cars are looping via Yonge Street and should be boarded at Victoria. 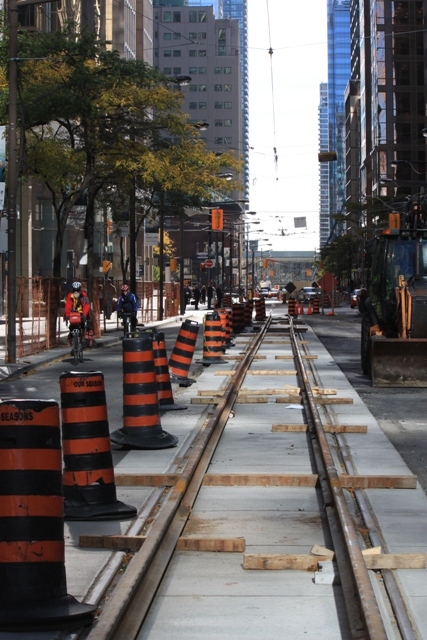 As there has not been any streetcar track on Yonge since 1954, this is rather challenging. The corresponding web page claims that streetcars are turning back at Victoria. Of course, as anyone who knows where streetcars short turn downtown could tell you, the cars loop via Church, Richmond and Victoria, and can be boarded eastbound on the northwest corner of Church & King. 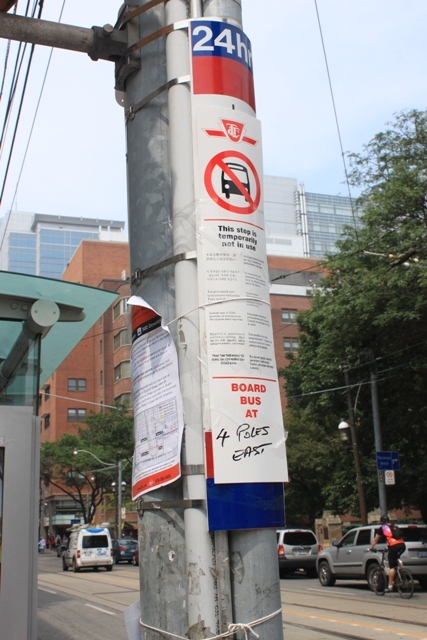 It is rather embarrassing when the TTC’s own Communications folks can’t put out an accurate diversion notice. 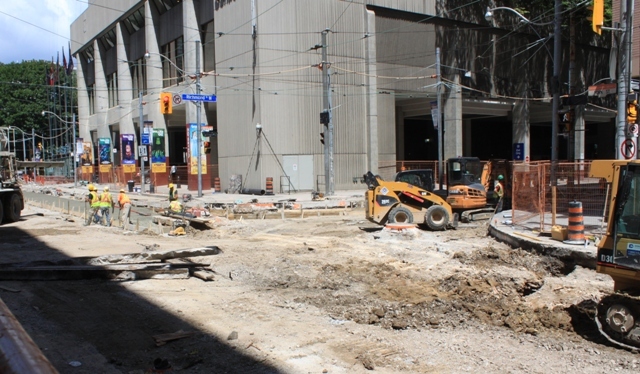 Demolition of the existing track at Queen & York began over the holiday weekend. The view below looks southwest to the intersection from the pedestrian bridge over Queen Street. The eastern approach and switches have been removed. Not visible in this photo is a large excavation for water main work on the southwest corner of the intersection. Trenching is also underway on York south of Queen for a new main. 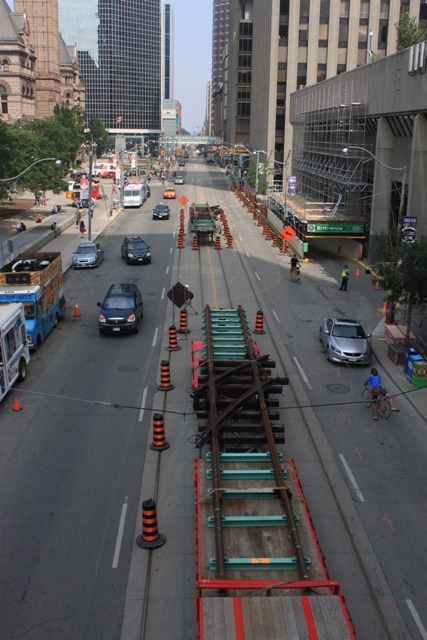 Looking east on Queen from the pedestrian bridge, two sections of rail are assembled ready for installation. They are parts of the north-to-west curve with the diamond crossing of the eastbound track in the near section, and the trailing switch westbound in the far section. The panel with the trailing eastbound switch is sitting just west of the bridge. As part of this project, the westbound carstop at University will be replaced. In the photo below, note that the excavation is only down to the bottom of the rails because this area is built to the “new” track standards. The existing rails will be unclipped from the steel ties in the second layer of concrete, and new rails will be dropped in in their place. This is an example of the saving possible with the new track structure because the street does not have to be excavated down to the foundation. Also visible, hanging off of the exposed rails, is the rubber sleeve that isolates the track from the surrounding concrete. 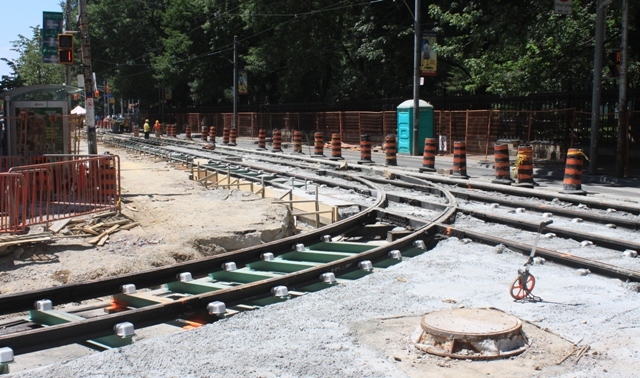 New track has already been stored on the east side of York south of King, and preliminary work is underway at the Queen and York intersection. 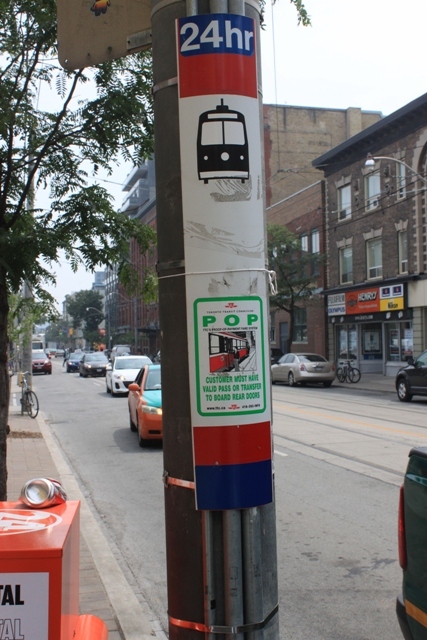 This will add even more streetcar traffic to the busy intersection of King and Spadina. This, plus road traffic diverted from Queen by the construction, should make King a challenging street for two weeks. Whether the TTC or Toronto Police will try to do anything about this, or will just leave everyone to fend for themselves, remains to be seen. 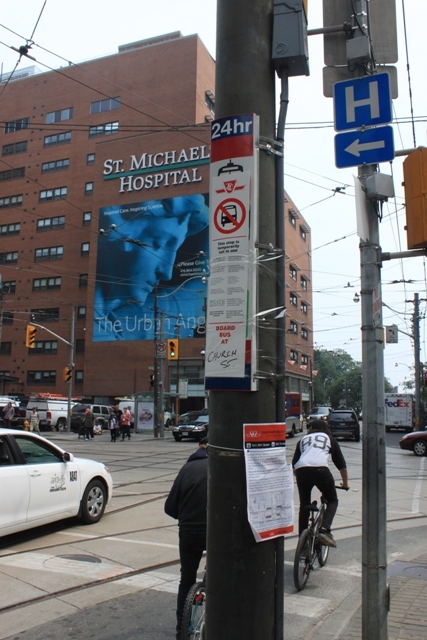 The intersection at Richmond will follow on the extended weekend of July 27 to August 4, and Adelaide from August 24 to 31. 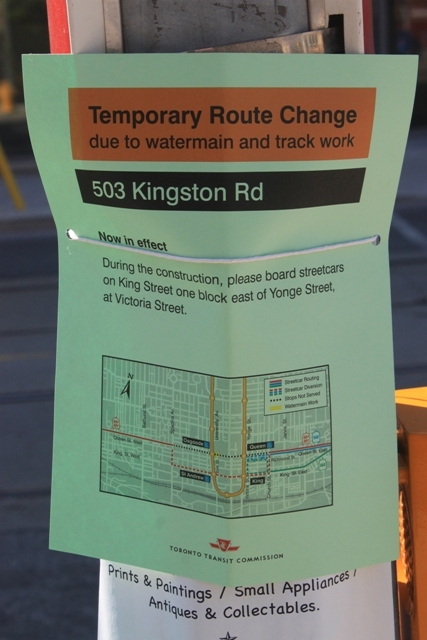 The August routing for the 503 Kingston Road Tripper is still unknown given that King and Spadina will be closed for reconstruction, and York south of King will likely have its track replaced at some point during the same month. Signage to advise passengers that the Queen street services are not where they might expect is rather terse. 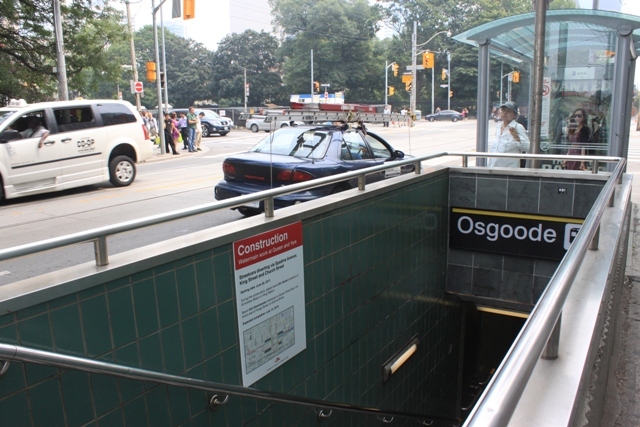 With the exception of several large notices in the southwest exit from Osgoode Station, there is a mixture of diversion maps printed on paper and standard temporary stop markers. The only language in which these are printed is English leaving those who might not understand what is going on in the dark. 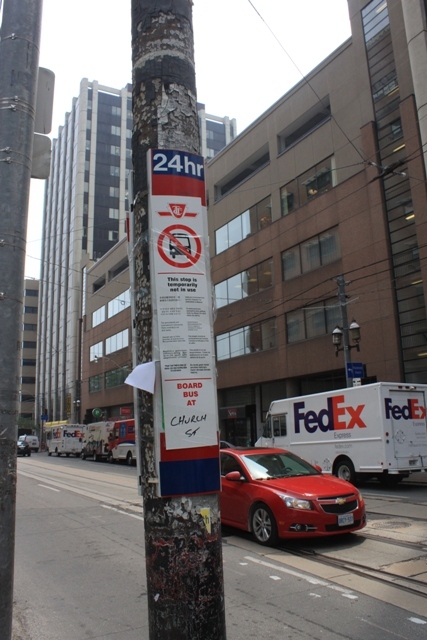 In the station entrance on the southwest corner by the eastbound carstop, there is one of the TTC’s standard construction notices. More of these can be found in the passageway to the ticket mezzanine. However, none is posted on the route a rider would take to the westbound stop. 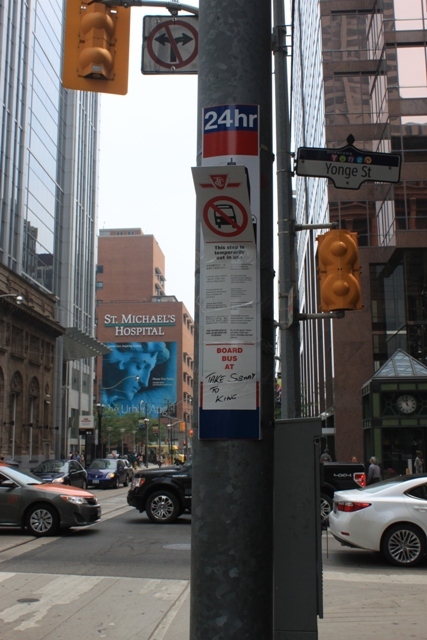 The stops (westbound and eastbound above) have a diversion notice and temporary signs directing riders to “Take the subway to St. Andrew”. A similar notice is inside the transit shelters (visible in the first photo above along). It is, of course, faster just to walk down University Avenue. At Yonge Street, riders are told “Take subway to King” even though for eastbound trips, a short walk east to Victoria (for 502 Downtowner) or Church (for 501 Queen) would do just as well. Both the eastbound and westbound stops exhort riders to board cars at Church Street although, as mentioned above, they will find 502 Downtowner cars right across the street at the “northbound” stop. That stop (the 3rd picture above) has the odd notation that it has only PM peak service. 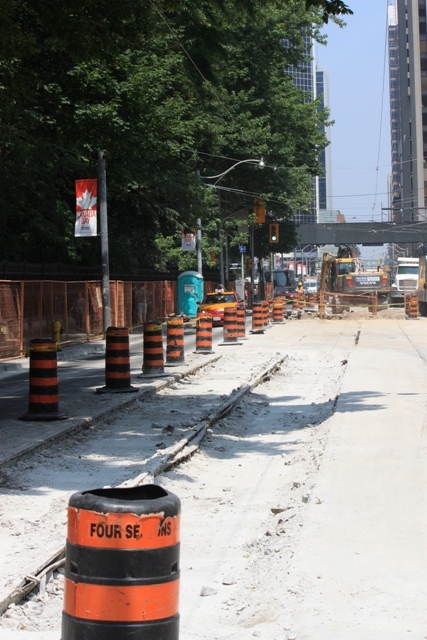 This would normally be the 508 Lake Shore car, but the stop is also served during the construction project by 502 Downtowner and 503 Kingston Road (once York south of King closes). Nothing on the stop indicates that this temporary service is available. 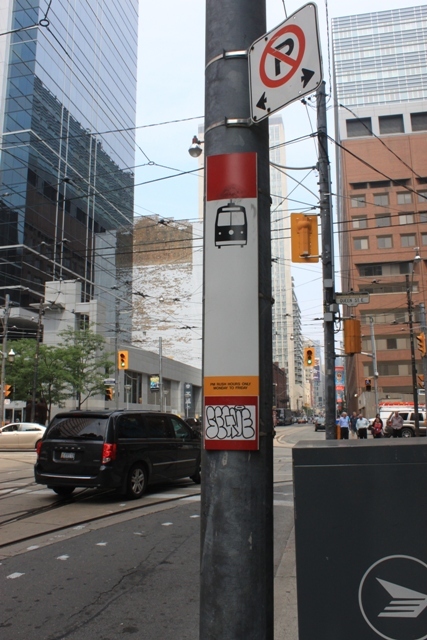 On the eastbound stop, we learn that service is available “4 poles east”, and once we figure out what this means, and peer down Queen, we may see the temporary TTC stop sign on a pole a few hundred feet east of Church. It is unclear why there isn’t simply a 501 Queen stop northbound on Church as there has been during previous diversions on this route. Possibly this arrangement gives a common stop so that the ever so infrequent 502 Downtown cars can share an eastbound stop. For this privilege, all riders get to walk an extra half-block. 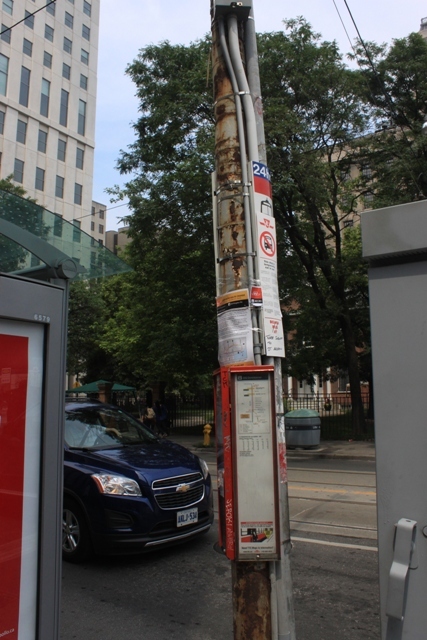 On the westbound stop, the string that once held the diversion notice to the pole is visible, but the notice itself is long gone. This is a typical problem, but it is at least at a stop where streetcars actually still provide service. 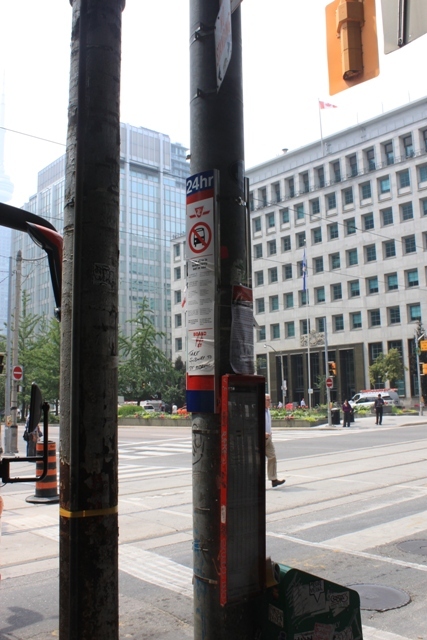 I have not had a chance to check other stops such as Bay Street and all of the stops west of University. The point at issue is that despite brave words about improved communication of service changes to passengers, the TTC has not changed much. Regular riders will figure out quickly enough what is happening if only because they are diverted as part of their regulatr commute. Occasional riders are not so lucky, nor are any who do not read English signs. As I write this, the TTC is still dealing with signal problems on the Yonge Subway, no doubt a much more pressing issue. That’s just the problem: we get ad hoc, hand-written signs and minimal use of large-scale, visible notices because nobody quite got around to it. For a two week diversion on a major route, that’s not a very good showing. This entry was posted in Queen Car, Transit. Bookmark the permalink. Has the TTC given any reason for the deferral? Any chance they are holding on a draft report for Adelaide, or is this just due to traffic planning/construction related delays? Steve: It’s not a TTC call. This is a city construction project. I was in Toronto today and noticed in a couple of places on York that the middle layer of Concrete in a couple of places, especially north of Adelaide, appears to come within a couple of inches of the rail. It appears to be an underground vault and there is not room for one of the steel ties under the track. The Pandrol clips are in place but nothing is under it. Do you know what they put under this track? Steve: I will have to look at it to see. I do know that there were some unspecified hydro problems on York, and this could be one of them. I was looking at the curve from Richmond to York the other day. It seemed like the radius was stretched a bit. Where track and specialwork are being totally rebuilt from scratch, is the curve geometry being relaxed to be friendlier to LFLRVs? The specialwork at Adelaide and York remains (briefly) a reminder of earlier days when Adelaide and York had two-way traffic. The intersection of York Street and Adelaide Street will be closed to traffic from Saturday, September 14 at 6 a.m. to Saturday, September 21 for streetcar track construction as well as road and sidewalk reconstruction. Traffic travelling east on Adelaide Street will be diverted onto University Avenue, while traffic travelling north on York Street will be diverted to King Street. Steve: Yes, I was going to blog on this once construction got underway, when I had time between movies at TIFF, and the weather was co-operative for a photo. I already have a “before”. I believe the conrete Robert was referring to is the roof slab of the pedestrian tunnel below York street just north of Adelaide. They would likely treat this as a bridge deck rather than on-grade construction. There are a few instances of such underground pedestrian crossings below York Street, and depending on how shallow they are, might require this sort of accommodation. 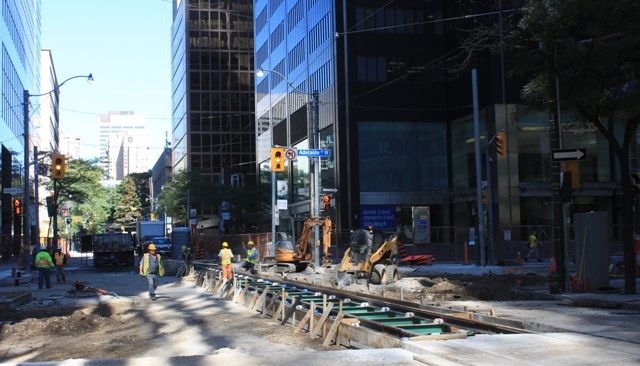 As of this morning, the straight through rails through Adelaide St. were in place with work underway to get them secured, plus work continues on tearing up Adelaide on either side of the intersection. Hopefully the new plans for Adelaide will include replacing the track and if it ever comes to pass, the intersection with York would have to have two curves and the diamond installed. The north to east curve would require cutting back the sidewalk at the south-east corner from a “squared off” corner to a more rounded corner. Steve: I have added a photo of the completed track. 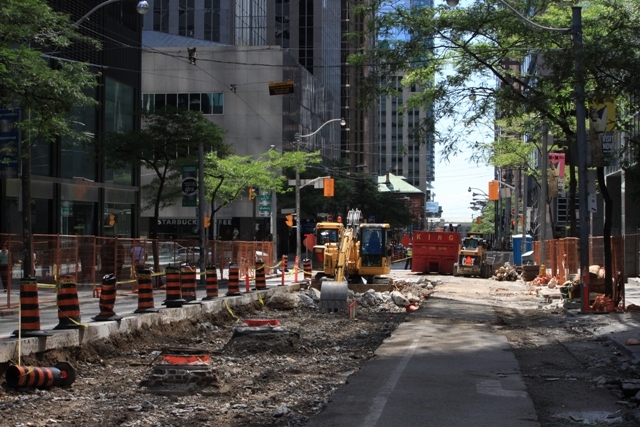 I had a short walk down York Street this morning, from Queen to King, observing the construction. The new track seems to be completely all in place. 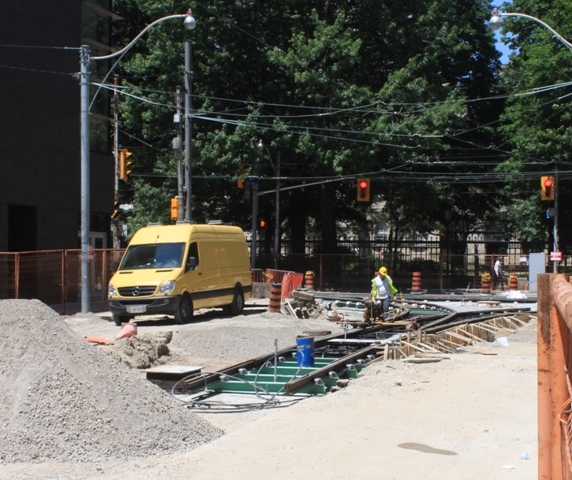 There was pouring of concrete for sidewalk at Richmond & York northeast corner, which was blocking the track. New track on Richmond westbound to York. Between Richmond and Adelaide there were long lengths of rail sitting atop the track, blocking it. I wonder what these pieces are for. Top coat paving adjacent to the track still needs to be done. Power wires all in place. Almost finished. Steve: The track north of King is awaiting other work getting out of the way, at which point it will be installed between King and Wellington. It looks like there was a hydro vault in the south-west quadrant of the intersection that hasn’t had any activity in several weeks until yesterday. This has caused the traffic on Adelaide to be forced into the two left lanes. There is also hydro work now going on along the west side of the street between Pearl and Adelaide. The repaving of York St. is all done except for those spots. There was a large stack of fresh lumber likely to be used to “deck” the excavations in the west curb lane next to the fresh excavation. Though it is good that Brad Ross has let you know that this project is (predictably) running late, it is symptomatic of the TTC that their website (which should surely be the first place updated) still says that York will reopen on 16 November. I read that some of the recommendations in the recently completed Downtown Traffic Operations Study included changing portions of one way streets back to two streets. Obviously this is too late for the York street trackage, but I wonder if this will affect the TTC’s reconstruction plan for other trackage downtown such as Wellington? I’m not sure if it would be meaningful, but would it give the TTC more flexibility? Steve: Without the track on York (southbound) and Church (northbound) and associated special work at King, two-way track on Wellington isn’t much good to anyone. The hydo vault excavations have been filled in and covered with asphalt, which naturally isn’t level with all the road repaving done previously, but at least the road surface is all there now so it shouldn’t be long before all the pylons are picked up and all lanes re-opened.